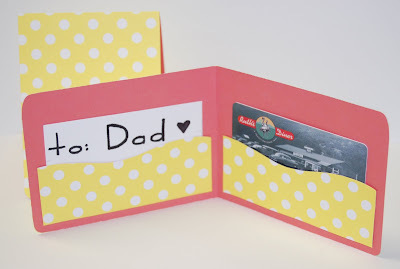 My niece and I made these paper wallets to hold a gift card for Father's Day. They are super easy to make. You can make them as simple or as decorative as you want. We opted for a simple style. 1) Cut a 8 1/2 x 3 1/4 inch strip of paper. Double sided paper looks best. 2) Fold that paper in half so it resembles a wallet. 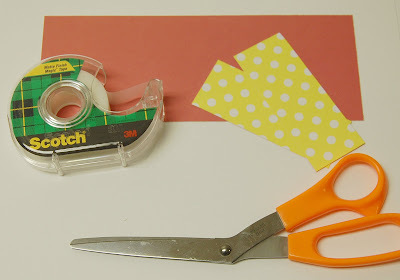 3) Take the scissors and trim the corners so they are rounded. 4) To make pockets you will cut two 3 7/8 x 1 1/2 inch strips of paper. 5) adhere them the the wallet by placing one on each side of the wallet near the bottom. Make sure to center them. If you would like you can cut them to make them more decorative. 6) Trace your gift card on a piece of paper and cut to use as a gift card. 7)Place the gift card in one pocket and the card in the other. You may need to adjust your pocket sizes for larger gift cards. Send me pictures of your wallet gift card holders. I would love to see them! I got mine in the mail yesterday with my gift card. I absolutely love the card holders and put it in a safe place to remind me to copy your idea. Thanks again for the carwash. I received one of these yesterday too and thought it was so cute and clever--typical DeeDee. Thank you so much! Darling! I think I'll make a few and have them on hand for gift cards in the future. How cute! Would it also hold an 'i owe you a present but not sure what you wanted' note? An i owe you. Love it! What a cute project! Did you get my email?? This is such a great idea, and so cute!